Are you thinking about a camping or backpacking trip with a hammock tent? We’ve done the research here’s what you need to know about this new trend. 9 Why choose hammock tents over traditional tents? 10 Are there any disadvantages of hammock tents? 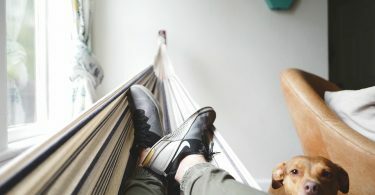 A hammock is a sling made from netting, rope or fabric, suspended from two trees (or and other two structures that you can find). Hammocks come in handy for resting, sleeping and swinging. They often consist of one or more cloth panels, a network of twine or thin rope stretched between two anchor points. The history of hammock tents can be traced to the native inhabitants of Central and South America who used them for sleeping. Today, hammocks are used for more than just sleeping, relaxing in ships or containing babies who are learning to crawl. They are also used as lightweight beds on backpacking and camping trips. There are two types of hammock tents available on the market i.e. bridge hammocks and gathered end asymmetric hammocks. Both designs come with removable or integrated no-see-um bug netting. Also, the sleeping position on both is relatively as compared to banana-shaped often found on backyard hammocks. Gathered end asymmetric hammocks: They are the most prevalent on the market and get their name from their asymmetric shape and ends that seem gathered into a single bunch. The asymmetrical shapes along with the width of these hammocks are what allow for the relatively flat sleeping position. The main advantage of gathered end asymmetric hammocks over the bridge hammocks is that they are lighter and have a less constrictive feel. Bridge hammock: It uses flat, non-gathered ends reinforced with a spreader bar. The result is more of a flat and not the curved banana shape of the gathered end asymmetric hammock tents. It has a flatter sleeping position compared to the gathered end asymmetric design. The main disadvantage of bridge hammocks is that the spreader bars add to their weight and for some campers, the tubular shape is constrictive. Nothing beats the coziness that comes with sleeping in hammock tent close to nature. These tents have become increasingly popular over the past few decades among scouting groups, campers and backpackers and understandably so. They offer protection from the elements and keep you out from the dirt. If you are in the market for a hammock tent, the following tips will help. The first consideration you should make when shopping for a hammock tent is its dimensions. Width: The width of hammock tents ranges from around 4 feet to 8.5 feet. The 6-7 feet range comfortably accommodates single users and sometimes even two people. Many solo users prefer narrow tents. However, it all depends on how much room you want. Nevertheless, it is important to remember that if overly broad, a hammock tent will wrap around you and make you feel claustrophobic. Length: The available lengths are far less than widths but make sure that you shop for something that’s at least 8 feet. This is also a matter of personal preference. Many hammock tents have a weight capacity that ranges from 150-500 pounds, so make sure that you check the specifications before paying for anything. If you expect to use it with your Great Dane now and then, invest in a heavy duty tent. 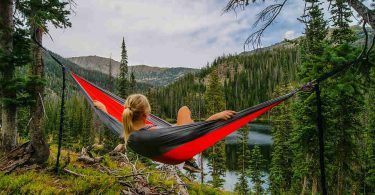 It is important to keep in mind that weight capacity only refers to static weight and that any jumping up and down will only reduce the lifespan of your hammock. Many hammocks utilize a breathable, nylon fabric that helps keep you cool during the warm summer months. There are a few that use cotton, but these are only for home use as they tend to be heavy and bulky, rendering portability difficult. If hammock camping in cold, windy weather; consider investing in accessories like under quilts and top quilts for additional warmth. Hammock Setups can weigh anything from 7ounces to a few pounds. Narrower and shorter ones will often be lighter than regular tents. Adding the ideal suspension system adds about 10-15 pounds. If you prefer ultra-light, some brands offer such versions of their models. Many hammock tents require a suspension system along with a pair of carabiners. 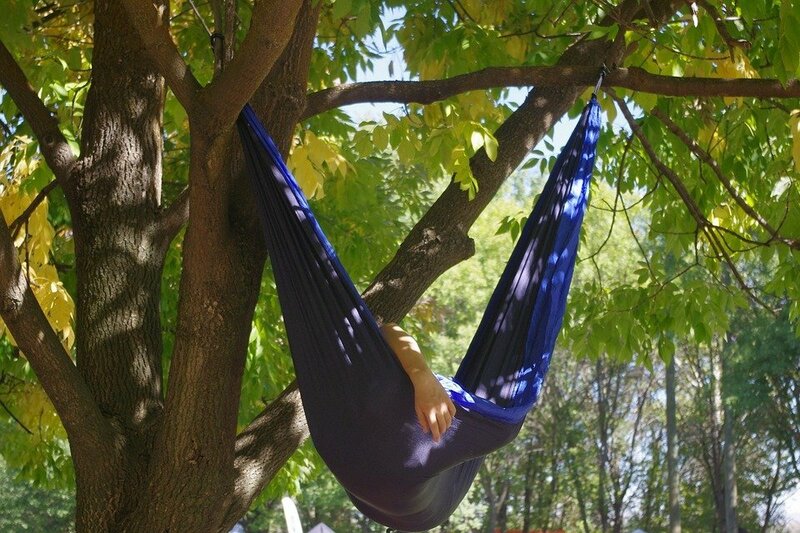 Many manufacturers offer them as part of the hammock package, but others sell them separately as accessories. Some of the suspension options you can opt for include nylon ropes (make sure they are not overly stretchy), synthetic tree slings and webbing straps (they should be at least 0.75 inches wide to ensure they do not injure the tree when weighted). Bug protection: 360 –degree screens, permethrin-treated models, and an add-on bug net are some of the options you have when it comes to ensuring that you protect oneself f from stubborn insects at night. Tarp: This is particularly important if you need to prepare for unexpected rain, which can put a damper on your camping trip. 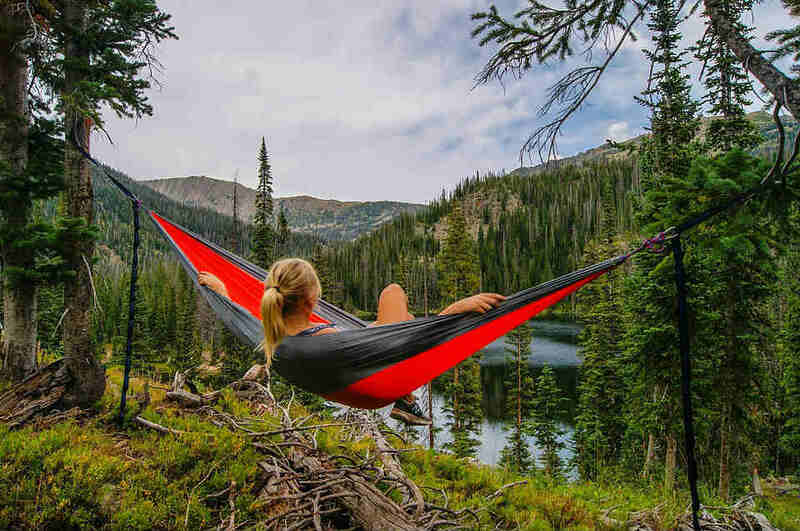 Many outdoor enthusiasts prefer waterproof tarps that are specially designed for shielding hammock sleepers from anything Mother Nature throws their way. Some tents come with a tarp included as part of the purchase. Why choose hammock tents over traditional tents? Camping is an enjoyable adventure to indulge in. The best thing about it is that it can be as versatile as you want it to be. This is to say that there is no limit to the places or ways you can camp. The traditional way of camping is tents. 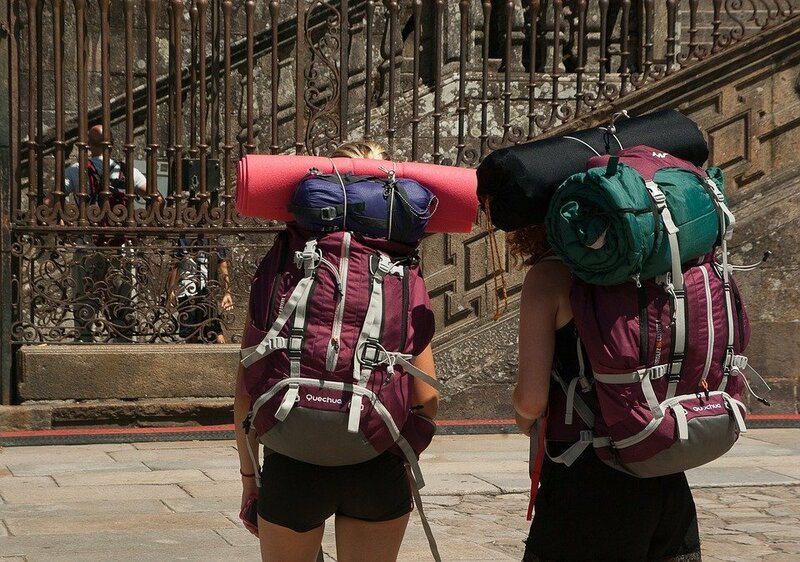 They are easily available, pocket-friendly, and have been used by hikers and backpackers for hundreds of years. However, traditional tents also lead to a variety of complications with the most frustrating one being difficult to setup. So what are the advantages of hammock tents over traditional tents? 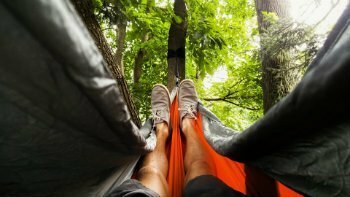 Is there a reason why you should opt for hammocks? Unlimited campsites: How often do you get to a campsite only to find that it overcrowded and littered? The choice﻿﻿ of campsites with a hammock tent is endless as all you have to do to find two trees (or use your imagination to find any other two structures to attach them to) within proximity of each other. As such, you can set up anywhere, and this saves you the amount of time spent looking for a clean, flat campsite. The views: The only way to make the dream of sleeping under the stars is to use a hammock tent. Fall asleep creating or pointing out constellations in the clear night sky. The views you get while sleeping on a hammock are incredible. Also, nothing beats the views you wake up to and realize where you spent the night. It is breathtaking. Peace and quiet: With the freedom to choose anywhere to setup, you can choose to camp in an area that’s away from people. If you are anything like me, you love spending time outdoors as much as I do. Unfortunately, achieving that is sometimes difficult due to the influx of people on established campgrounds. However, that is no problem if you have a hammock tent because you can camp anywhere. Reliable sleeping conditions: Sleeping arrangements change almost every night when on the move. Slopes and terrains are always different every night. One of the benefits of hammock tents is that they allow the sleeping conditions to remain constant and ensure that you get a good night’s rest. Quick setup: It does not take an eagle scout to figure out how a hammock tent should be set up. You just have to use the three connectors or straps to attach the tent to two trees. Putting up a hammock tent is not something that requires classes. You just have to read the manual to make a cozy bed. 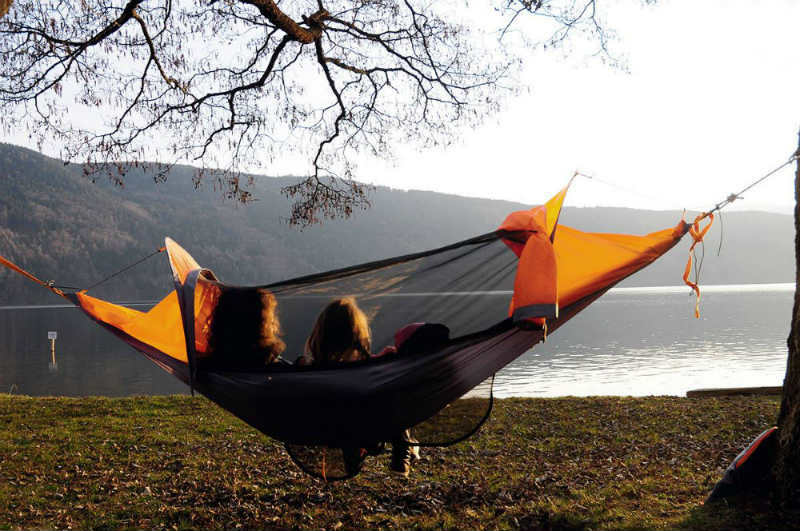 Weight savings: The weight of hammock tents ranges between 7 ounces to a few pounds. That is something that no traditional tent can beat, making hammocks incredibly easy to take with you on camping and backpacking trips. Moreover, they small and take up little space in your backpack. Are there any disadvantages of hammock tents? Despite their many benefits, hammock tents are not flawless. The fact that they are mostly meant for one person and that they require at least two strong trees are two of the main setbacks of these tents. Hammocks can also be cold, especially if you do not have enough insulation. Losing heat from the underside is common. This is because insulation from sleeping bags and clothing is compressed. An additional sleeping pad can work fairly well, but it also adds to the overall weight. Moreover, compared to traditional tents, hammocks do not offer as much privacy. When going camping in great weather, a hammock tent is what many outdoor enthusiasts count on. They are the best sleep system in areas where trees are available. The fascination of what using a hammock tent would feel like is what drove many to use it. Increased exposure to the thrill of using these tents made people realize how the experience was so much better than what they were used to. This was particularly true for those camping in wooded areas. The popularity of the hammock tent among outdoor enthusiasts has increased considerably and will continue do so. The fascination of what using a hammock tent would feel like is what drove many to use it. Increased exposure to the thrill of using these tents made people realize how the experience was so much better than what they were used to. This was particularly true for those camping in wooded areas. The popularity of the hammock tent among outdoor enthusiasts has increased considerably and will continue do so.